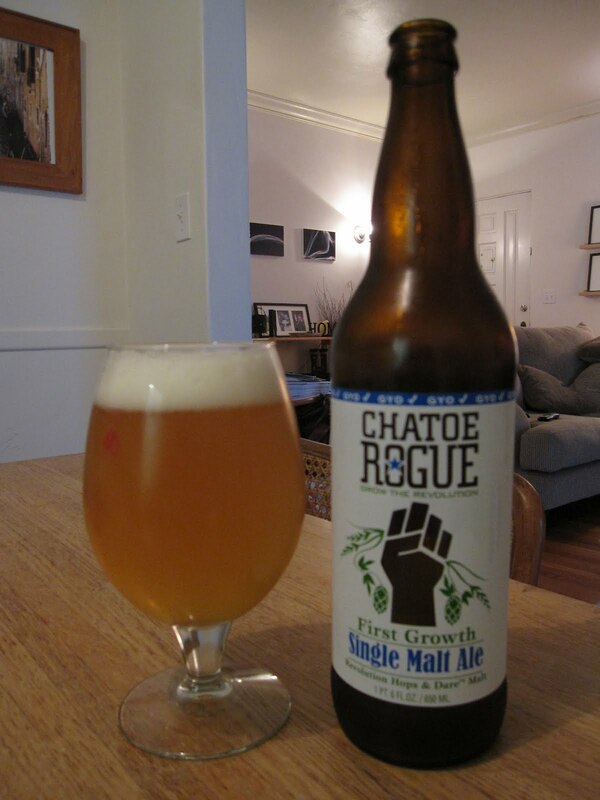 The second beer of the Chatoe Rogue line, following the Good Chit Pilsner of which I thought highly. "Single Malt Ale" doesn't really refer to a specific style, but the website says it's a blonde ale. The Good Chit is made using floor malting. And since single malt whisky is usually made via the same process, I presume that a "single malt" ale is as well. But the website doesn't state that, so I'm not sure. This smells like a blonde ale, malty and fruity and sweet but also fairly light. There's also a nice bitter hop note in there that's well-sustained by the head, plus a bit of citrus. The flavor's a lot more bitter than I'd anticipated, on a similar level as a well-hopped pale ale. I'm surprised by it, because I expected the malt to play the lead given the name. But the hops are definitely the big dog here. The citrusy flavors aren't as strong as, say, a west coast IPA. They're there, and they're pretty tasty, but this is more piny than citrusy. I wouldn't call it crisp, because the malt gives it just a bit too much body for that. While the hoppiness is a nice surprise to my now bitter-friendly palate, it also prevents any of the malt complexity from showing as much as it does in the Good Chit, which makes it seem like the name is a bit misleading (especially from a whisky-drinker's perspective). In the end, I find this beer pretty tasty, but also a bit confusing because it wasn't at all what I was expecting. I'm not sure if there's anything to really distinguish it when you're beer shopping, though. I mean, it's nice that they use all Rogue-grown ingredients, but dedication to homegrown grain and hops doesn't necessarily mean the flavor is going to blow you out of the water. So it's good, but there are a lot of beers that are good. I'd be interested to see what would happen if they added some wheat to the base grain bill. Of course, they couldn't call it a single malt ale anymore (I guess it'd be a blended ale? ), but wheat could add some enhanced fruity/sour complexity that could take this up a notch. Looks like someone needs to learn how to use the focus on his camera. This chit is also pretty good on tap, but I've only found it in Salt Lake City. Not quite worth the trip from here.